Our latest adventure brought us to the United Arab Emirates' capital city of Abu Dhabi. Every time I mentioned to friends and family where we were going, I was met with a slightly puzzled reaction. Abu Dhabi is one of those places that hardly anyone from the United States will ever visit — or even take the time to learn where it is, exactly. I was guilty of the latter before planning this trip! It's too far (14 hours from New York by plane), too foreign (in the Middle East), and too obscure (overshadowed by Dubai, the UAE's more glamorous city). But I have a cousin who's been living and working in Abu Dhabi for the past few years, and we finally decided to take her up on her offer to visit. Well, it turns out that Abu Dhabi is like nothing I could've imagined. It's both an ultra modern city, with gleaming skyscrapers and international eats, and a gorgeous beach destination, with miles of sand bordering the azure blue Persian Gulf. There's so much for kids to do. 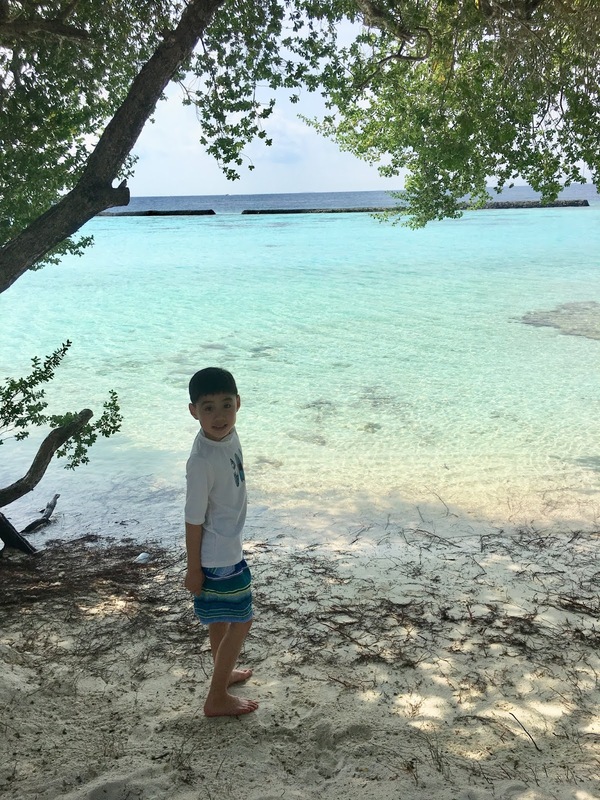 It was an absolute delight to visit, and the three days we spent there wasn't nearly enough time to see it all (we ended up spending the rest of our week in the Maldives). Our trip took place in February, a month where the temperatures are pretty perfect — mid-70s and sunny. In the summer months, it's blazingly hot (it's the desert after all! ), but during the winter months, the weather is gorgeous and makes for a great getaway from a Northeast winter. Hands down our favorite part of the visit was checking out the Abu Dhabi Desert with OceanAir Travels. We chose an afternoon package that included dune bashing, sand boarding, camel feeding and riding, a barbecue dinner, and a dance show. Dune bashing, in case you didn't know, is riding in an SUV with a licensed desert driver who cruises over, down, and along the side of sand dunes. It's a wild ride, and everyone in our car had a blast! The sand boarding was super cool as well. We basically slid down a steep dune on sleds and snowboards. It wasn't hard to do and really thrilling, but you end up eating a lot of sand! We also loved feeding the camels and then going on a quick loop with them in the desert. The ride was no longer than five minutes, which I thought would be too short, but turned out to be the perfect amount of time for riding a camel. And finally, we ate dinner at a camp in the desert that was set up around a low, carpeted stage. The barbecue tasted great in the cool, desert nighttime, and the dances put on by the whirling dervish and belly dancer were impressive and entertaining. All in all, we had the best time on this excursion. For a completely different experience, we spent a morning visiting the Sheikh Zayed Grand Mosque, truly the grandest building I've ever been in. Sheikh Zayed was the UAE's founding father and revered all over the country. You'll see portraits of him all over the place, from the airport to restaurants to hotels. His body now lies at his namesake mosque. You could tour the mosque with a guide, but since we were going with the kids, we decided to walk around at our own pace. It took us about half an hour to see all the parts that are open to the public, including a prayer room that holds the largest rug in the world! Note that women must be covered from head to toe when visiting the mosque. Men just need to cover their arms and legs, and the rules are more lax for children. If you don't have the appropriate clothing, they'll lend you an abaya (the red robe I'm wearing at the top), free of charge. One of Abu Dhabi's most popular family destinations is the Corniche, which is a paved boardwalk that lines the public beach. We checked it out briefly to dip our toes in the Persian Gulf (chilly in February). There are many entrances along the Corniche for accessing the beach; I recommend Entrance 3 for the very nice playground on the sand and many food stalls. The falcon is the UAE's national bird, and we spent one morning touring the popular Falcon Hospital. I wasn't sure what to expect, but the tour ended up being really interesting and informative. First, we got an overview of the three types of falcons that people keep as pets around here, along with some basic facts about falcons. Then we were ushered in the falcon waiting room, where dozens of falcons were quietly perched on astroturf-lined benches, waiting to be seen for various reasons. Most were there to be groomed. They each wore a little cap on their heads that hid their eyes so they wouldn't be aggravated by the sight of one another. We watched two demonstrations in that room — one falcon was anesthetized and then got his talons cut short and resharpened, another falcon was fed a defrosted quail, which it ate, bones and all. It was really cool. Because Abu Dhabi is so international, with many expats living in the city, the dining is similarly international. While in Abu Dhabi, we ate everything from sushi to pizza to many Mediterranean-influenced dishes that we'd never tried before. Our favorite was feteer, a flaky Egyptian pastry oozing with your choice of savory or sweet filling. We got three kinds from Khafayef Pastry: meat and potatoes; cheese and honey; and Nutella and honey. We also tried a lot of Lebanese goodies. Some of our favorites included an herbed flatbread called manouche, a yogurt and chickpea mixture called fatteh, and a cotton candy-like dessert called ghazl el banet. Be prepared to eat a lot of pita and hummus. It's so creamy and fresh in every restaurant! About an hour of Abu Dhabi is the flashier city of Dubai. Featuring streets illuminated by sparkling lights, water fountain shows, and Burj Khalifa, the tallest building in the world, it's definitely worth a visit. We checked out one of the many amusement parks in the area, Motiongate, and had dinner at Abd el Wahab, a Lebanese restaurant in the Dubai Mall, right across from Burj Khalifa and next to the fountain. The fountain puts on a show every half an hour that's similar to Las Vegas' Bellagio Fountains — but it's somehow even grander! During our visit to this part of the world, we also hopped on a plane for 3.5 hours to relax in the Maldives for four days. I don't know how to properly describe this paradise in words. Think the bluest, warmest ocean you can imagine, white sand beaches, and superb resorts. They're not super expensive either; it's just expensive to reach this part of the world from the States. But if you're ever visiting somewhere nearby, definitely go. The Maldives easily ranks as No. 1 in my book of tropical locales. The Maldives is made up of a series of islands, and each island houses a resort. We chose Kurumba, which is only a 10 minute ferry ride from the main island of Male, where the international airport is. You have to take a ferry or small plane from the airport to reach any of the island resorts, and we picked Kurumba because it was a relatively short ferry ride away. The service at Kurumba is impeccable, the grounds are absolutely beautiful, and the food is top notch. We stayed in a beach bungalow, and our bed faced a set of double doors that opened onto the sand, with the ocean about 15 feet away. The kids couldn't get enough of the outdoor bathroom, my husband couldn't get enough of the snorkeling, and I couldn't get enough of the comfortable daybed on our private patio looking out onto the ocean. It was a truly wonderful stay in every way.